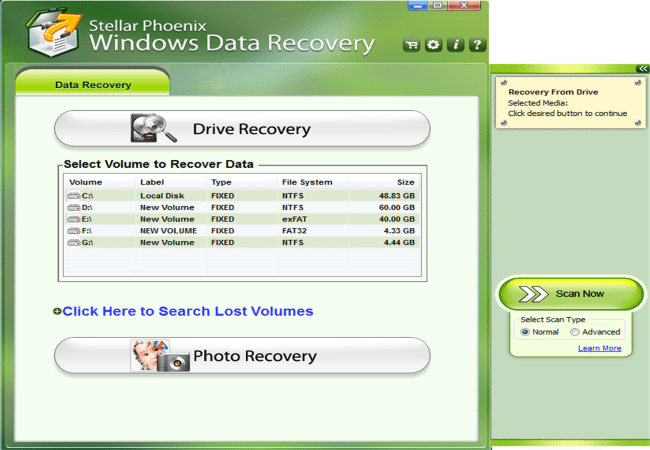 Stellar Phoenix Windows Data Recovery is a simple program through which you can recover your lost files. It can recover files: those have been deleted by accident, because your hard disk is damaged, the partitioning or after formatting disk. You need not to have any technical knowledge to use it. 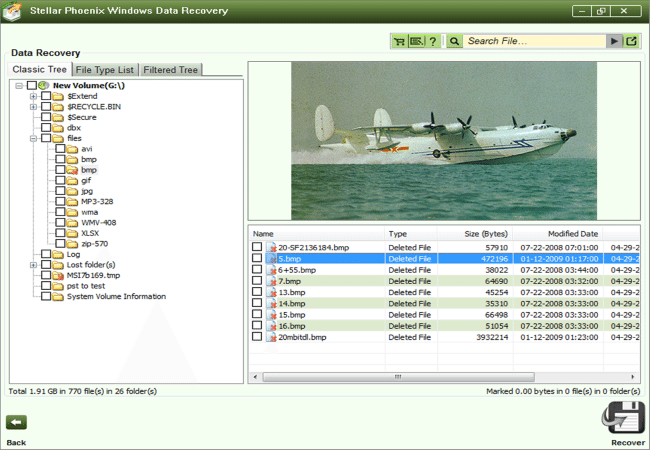 It offers a preview of the files to be recovered. You can bring back files of many different formats and in a variety of devices (hard disks, DVDs, memory cards or mobile cameras, USB drives, etc.). 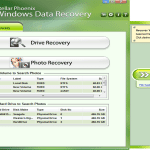 Stellar Phoenix Windows Data Recovery is a great data recovery software with some very impressive added features. 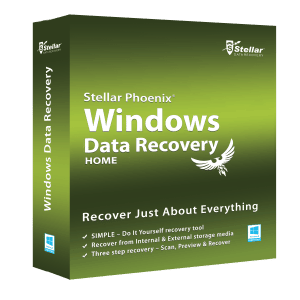 With Stellar Phoenix Windows Data Recovery, we’ll be able to recover the information not only on hard drives, but also in other storage devices such as USB drives, CDs, DVDs and different memory cards. Another remarkable feature of this software is its ability to recover almost 200 different file types and the fact that it is compatible with all latest Windows operating systems, including some versions of Windows Server. Stellar Phoenix can recover data from hard drives with up to 2 TB capacity, and is also very efficient when it comes to rescuing lost data on USB drives, CDs, DVDs and memory cards for cameras and mobile. As with most applications of this type, Stellar Phoenix can recover files as long as they did not write about them. The program, however, is able to perform complex tasks like retrieving information from reformatted drives or partitions that have been changed. Before you buy the software, the company Stellar Data Recovery lets you see if what you want is actually recoverable or not. After installation, you will be offered 2 options: Drive Recovery and photo recovery .Once opened, you can select the volume or media from which you want to carry out recovery and look out on the tab or tabs that are open on the right. The Drive Recovery is obviously the most powerful function and presents several methods: quick recovery of deleted data, advanced recovery and RAW File Recovery. The rapid method generally takes only a few seconds to scan the drive, while others will last more or less time depending on the size and number of files. The RAW method can take up to an hour on a large disk. Among the advanced scanning options, you’ll find a deep scan, and a search option. To search your files easier, Stellar Phoenix gives you details of the files and previews them. This program can recover files such as audio, image, video, databases, internet files and all types of office documents, including docx, ppt and xlsx. The module Photo Recovery is not just specific to deleted images (search formats such as jpg, gif, png and bmp), but also for video and audio files in wav, wmv, mp3, mp4, mov and avi among others. Something to keep in mind though, is that the Home version of our analysis offers some advantages, which are themselves included in the Pro version, including the ability to make a disk image, a feature that can be quite useful as always safer to extract files from an image of a damaged disk, or e-mail retrieval. If you are familiar with Windows, navigating through the interface of this program will be very simple. Stellar Phoenix shows recoverable files in three different views: classic tree with a very similar to the Windows folder, available by file type list, grouping files by format, and filtered Tree , which organizes files based on specific criteria. The preview offered by the program is excellent, and not only by name (full or part of it), the Stellar Phoenix has a variety of search options: file type, modification date, creation date or size This will make it easier to find the files you want to recover, it is possible that they do not have the same name once they’ve been deleted. If you have already experienced the loss of important files, know that it is a frustrating situation that produces great uneasiness, especially if you’re not an expert in computer science. So another huge advantage of Stellar Data Recovery is its customer service is magnificent. The company has several helplines, including two in Europe (Britain and the Netherlands), open Monday to Friday 24 hours. In addition, Stellar Data Recovery offers their customers a live chat service. and very useful Knowledge Base you can search to find the right answers. Should I buy the Stellar Phoenix? 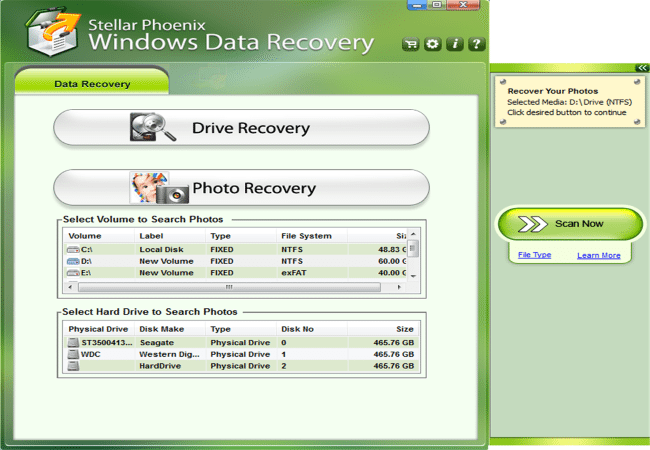 Stellar Phoenix is the perfect data recovery program because its management could not be more simple and intuitive. Recovers about 185 file types (image, video, audio, internet or Office etc. ), and rescues a variety of storage units: internal and external hard drives, CDs, DVDs, memory cards and USB drives. Its interface is similar to those of Windows folders, so clear that it will be almost impossible to get lost in it. If a problem arises, however, the customer service of the company is superb, with open phone Monday to Friday 24 hours service call via Skype, live chat and email. The Stellar Phoenix is a data recovery program that will bring you back very different type of files (images, audio, Office documents, files from the Internet) and, above all, it is extremely simple to use, making it the perfect recovery software for the novice. If the file you are looking for is there in preview, be certain that it will be back.